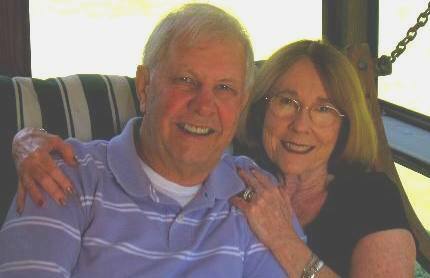 We are headed to Mt. Evans today. But before we get to Mt. Evans we must negotiate US-6 following Clear Creek into the Colorado Rockies. 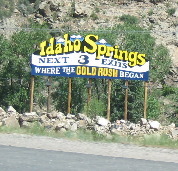 The last time we headed west out of Golden we went up and over Lookout Mountain. This time we are following a creek through a canyon. US 6 is a good road even if it has more turns than a ball of twine. The twists and turns make it interesting. However, the most interesting thing about this drive is the tunnels. 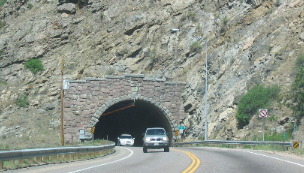 There are 6 tunnels in the 20-miles or so that we are on US-6 before it merges with I-70 near Idaho Springs. Joyce started taking pictures of the tunnels as they came up. For some reason she only got pictures of 5 of the tunnels. I have no idea which one we missed. They actually number the tunnels. 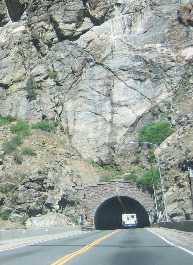 Another tunnel on Clear Creek Canyon Road west of Golden, Colorado. 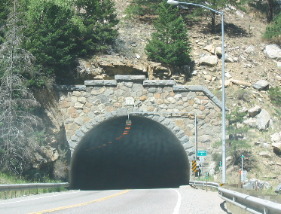 The tunnel on the left is on US 6 while the twin tunnels on the right are on I-70 near Idaho Springs. Idaho Springs is a neat mountain town 20-miles or so west of Golden. 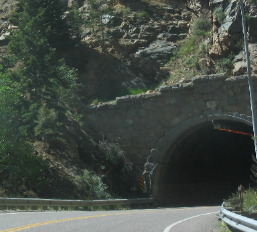 The western end of Clear Creek Canyon Road is at Idaho Springs where US-6 merges with I-70.